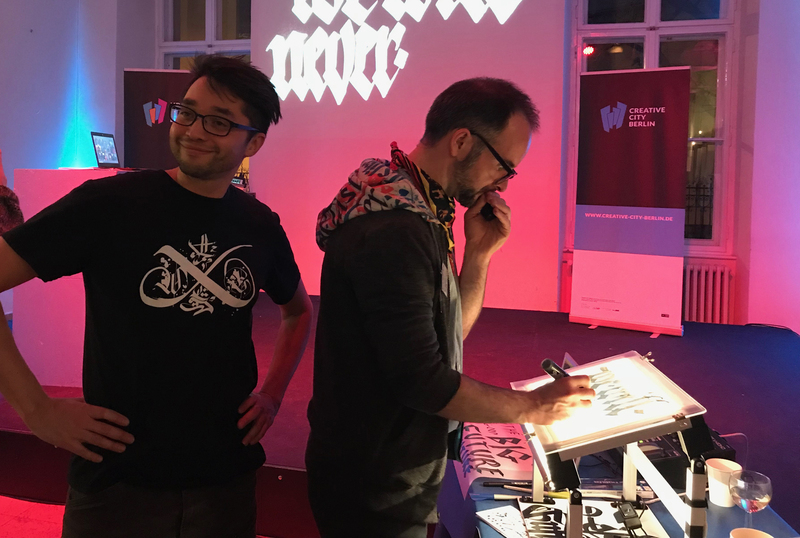 After a series of breathtaking events during the White Wall Festival – Meeting of Alphabets in Beirut, Digital Calligraffiti returned to Berlin to celebrate 10 years of Creative City Berlin. Creative City Berlin is behind most of the cultural events carried out in Berlin having as mission to promote artistic & cultural activity within the city as well as promoting organisations & artists. Evolving around the topic of the Big Good Future Michael Ang and Drury Brennan presented a special showcase inside Podewil building where Creative City Berlin is hosted and many cultural programmes take place. 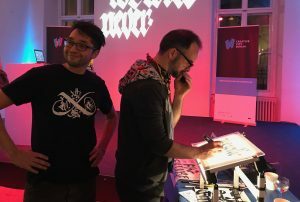 The audience was asked to give the artists their messages, which were transformed into calligraffiti tags and projected on the walls of the building for the whole evening, alongside exhibitions, presentations and talks that were held for this special occasion.